So I meant to get this post written awhile ago, but I’m a terrible planner of things. So we’re doing it now. I’m sure a lot of you have already, but seriously. It’s really good. It’s easily discounted as a movie that will amount to nothing more than a 2 hour toy commercial, which is what I was expecting. But it’s really so much more than that. I grew up playing with Lego, so sure, this movie will tug at my nostalgic heart strings a little bit. But Phil Lord and Chris Miller (who also made Clone High, which is probably one of the best cartoons ever) took that nostalgia and instead of exploiting it and making a crappy movie (I’m looking at you, every Transformers movie) they crafted something that’s really a love letter to Lego, people that grew up playing with Lego, and kids that are growing up playing with Lego now. I won’t spoil anything, but the voice acting is incredible (Will Arnett absolutely steals the movie as Batman and Morgan Freeman can be surprisingly hilarious) the animation is wonderful and it’s actually more stop motion than I was expecting, and the act 3 reveal creates this massive “aha!” moment that makes so many other things about this movie make so much sense. Neat side note: the main villain, Lord Business, was designed so that he looks like a necktie from the back. That’s the kind of detail they put into this thing. Holy crap Guardians of the Galaxy. Having limited familiarity with the comics for this team they seemed like kind of a low-rent, intergalactic Avengers team, but man this trailer blew me away. 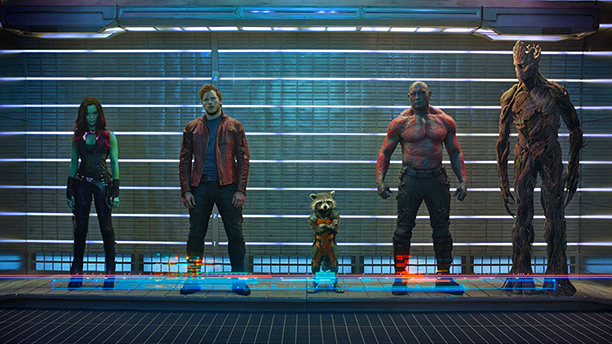 Chris Pratt (who also plays Emmet in The Lego Movie) nails that sort of cocky-but-you-love-them-for-it space hero character as Peter Quill, Rocket Raccoon and Groot look incredible, the whole cast just looks great. Zoe Saldana really pulls of this “I could totally kill you right now” look and she’s only got maybe 10 seconds of screen time. Plus any trailer that can make “Hooked on a Feeling” work, and even kind of badass has my interest. John C. Reilly, and Peter Serafinowicz as members of Nova Corps look great and I now have far more faith in this movie than I had a year ago. So pumped. If you’re like me, you’ve watched the trailer a few times already, but if not you can watch the trailer here. What do you guys think? Tell us in the comments maybe? Hey, chapter one is finished! I don’t know that the chapters I have are arranged in any meaningful structure. Some of them are really short (eight posts) and some of them are way longer (eighteen posts) and it just sort of depends on the amount of exposition that the plot needs at the moment. I have a lot of fun writing this comic, and I’m really having a good time building the world. Coming up, we’re going to see some more general samurai stuff that you might see in a movie, which is pretty fun, but also some pretty crazy surprises down the road. Initially, I had conceived this whole story as having a lot of political intrigue and deception, but I could never really write that how I wanted. It always just sort of ended up being this generic everyone backstabs everyone plot, and I really hated how that turned out. I was always drawn to writing some Big Adventure. The Big Adventure is a wonderful plot that I think allows your Bilbo Baggins to transform from a homebody to an accomplished thief. This really appeals to me for this strip because I’m not familiar with the ins and outs of Japanese statecraft, but I am familiar with being creative and building a world that I like. Sometimes I struggle with some of the things that are headed our way because I feel as though I sacrifice Good Story for Fun Story, but then Tyler shows me what my Fun Story looks like illustrated, and I know I’ve made the right choice, and that Good Story and Fun Story can be one in the same. I hope you guys think I’ve made the right choice as well.